Are you like your cat? Remember everything I went through trying to decide what how and when to feed my cats? Doing all that research on “what’s really in cat food”, reading ingredient labels, counting calories… I wrote several blogs about it. I can live with our current routine but I have to monitor the eating b/c Simba will only ever eat about 1/3 his food then I have to cover it – or else Tigger will get it. A while later I can always coax Simba to eat some more. The easiest way for me to deal with my own food “issues” was to eliminate them all completely while I did a 10-day detox cleanse of green-powder-shakes & pills. It gave me some time to start figuring out how to go about changing my diet. Yesterday I finally cooked and ate a real meal. 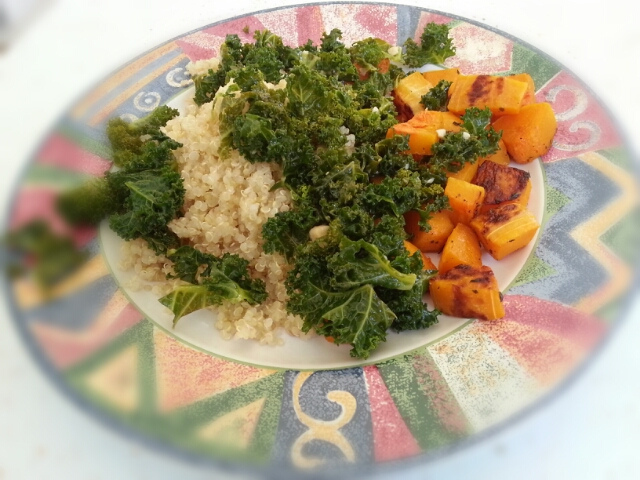 Quinoa, sauted kale, roasted squash. I seriously did heap a whole plate full of this healthy meal. And then I ate less than a 1/4 of it before I was exhausted from chewing. Then I literally had an image flash through my mind that I could just cover it and finish it later. 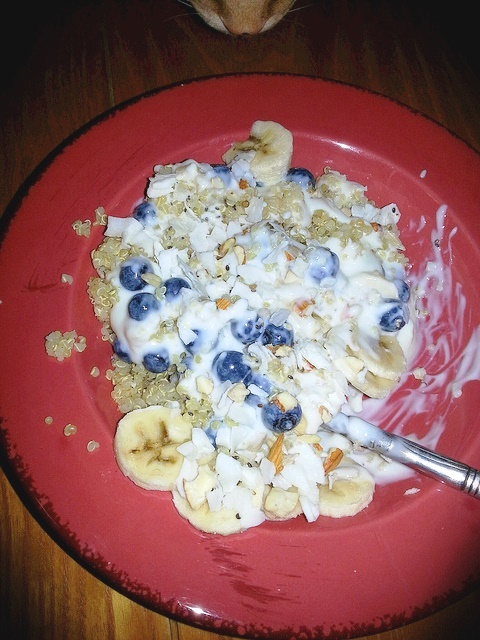 Quinoa, chia seeds, almond, sunflower seeds, raw coconut, blueberries, 1/2 banana, plain nonfat yogurt bowl. I did manage to eat the whole bowl but it took me 45 minutes. The one thing that I did not anticipate on my 10-day detox was that my stomach might actually shrink. So now I know how Simba feels! How are you like your cat??? We have 4 cats and one is on a sensitive stomach diet, one has urinary issues so he needs a special diet for that, one eats normal food, and the other absolutely refuses the good food and will only eat dry. And of course, they always want to try to eat everyone else’s food (except the dry food lover!). They are so difficult!